Ashton Ridge Homes would like to inform you of some key warranty and maintenance items required throughout the year. While all items that fall under the Tarion warranty requirements will be repaired by the builder it is important to understand the timelines for these repairs. Seasonal and Special Seasonal Warranty Items represent items on the exterior of or outside your home that can only be effectively repaired between the dates of May 1st to November 15th. As set out by Tarion’s warranty guidelines. These items will be completed or repaired within the elected seasonal dates. Special Seasonal Warranty Items include final grading, landscaping and the installation of driveways, patios and walkways if applicable. If occupancy of your home takes place during a season in which we are unable to lay sod or seed, our grading crew will be in the area between the dates of May 1st and November 15th for completion. Bear in mind that while it is the responsibility of the builder to ensure that the final grading at your home is completed, the maintenance of the landscaping is the responsibility of the Homeowner. It is imperative that once the sod is installed, it is watered every day for the first week, preferably in the morning or evening, and then every other day until a good root structure has been established. The builder will not return to repair sod that has died due to insufficient or excessive watering. In an effort to prepare you for the years to come, Ashton Ridge Homes has attached a Home Maintenance Checklist. This list should be examined monthly to ensure that you are meeting the requirements for maintaining a new home. Keep flowerbeds/landscaping at least 6 inches away from the top of the foundation. Never change the direction of the grading or slope of the ground away from the home. Clear eaves troughs regularly and extend downspouts to direct water away from the building. Inspect the caulking around windows and doors. Have your roof inspected on a regular basis. Purchase a ‘hydrometer’ to monitor the relative humidity on a regular basis. When using a humidifier or dehumidifier be sure to follow the manufacturer’s instructions. In the winter keep the relative humidity levels between 30-45%. Ashton Ridge Homes will provide a dehumidifier to assist with this. Continue to run the in-line fan system provided by Ashton Ridge Homes on least low position for at least one year after taking occupancy. 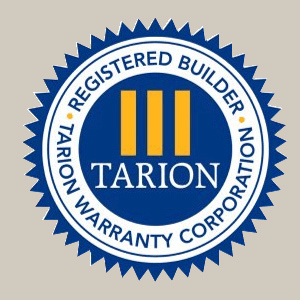 While Ashton Ridge Homes remains committed to the statutory warranty coverage as set forth by the Tarion Warranty Corporation, it is essential that homeowners conduct regular and proper maintenance on their home in all areas as to ensure their warranty rights are protected.